August 6, 2018 – The Wichita Business Journal – By Bryan Horwath – Reporter, Wichita Business Journal – Read the original article here. “Weigand-Omega Management Inc. and Omega Senior Living again this year are helping to provide some area teachers with supplies for their classrooms. 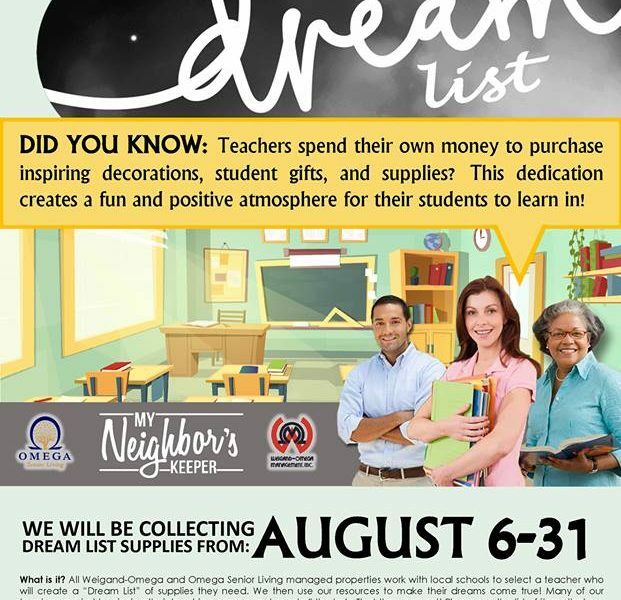 The company — Weigand-Omega started Omega Senior Living in 2016 as part of a diversification of its property management services — is now in its third year facilitating the program, which is called the Teacher’s Dream List drive. The idea for the program, according to a release from Weigand-Omega, stems from the fact that teachers at times spend out of their own pocket for classroom decorations, games, furniture and other items. One of the educators the Weigand-Omega corporate office in Wichita is working with this year is Ashley Sinness, a first-year teacher at Linwood Elementary. Some of the items on Sinness’ list, which can be found here, include floor pillows, Legos and storage baskets. Sinness recently graduated from Kansas State University with a master’s degree in teaching. Weigand-Omega says all of its offices and properties nationwide have reached out to a school in their respected community. In previous years, items such as fish tanks Apple TVs and bean bag chairs have been donated. “Because we are a national company with over 100 locations, collectively as a whole we can impact a large number of kids while showing support to our teachers that play such a vital role in our society,” said Craig Hanson, Weigand-Omega’s president, in the release. To help with the drive, interested parties are asked to contact any Weigand-Omega- or Omega Senior Living-managed property or call the company’s corporate office at 316-263-2215.